At one time my eldest granddaughter Rebecca was so interested in roses that I gave her about 15 plants. When she was 13 she could be blindfolded and still identify about 10 of my roses on scent alone. But alas she became a difficult teenager and lost interest. I live in the hope that all that information in her head will not be lost and that one day she will come to my garden and show interest. My other granddaughter Lauren who is now 13 keeps most of her emotions to herself. You never know what she is thinking nor does she ever start too many conversations unless she is playing with her best friend and neighbour Alina. When she comes for dinner on Saturdays she sits across the table and stares at me like a sphinx. I have no idea on the why. When she was a little girl she used to say to me at the table, “Don’t see me!” Perhaps she is getting even. A few times she has told me (without me asking) that her favourite rose is the English Rose Rosa ‘Abraham Darby’. This rose has a superb scent of fruit that is not cloying and the blooms are huge. I called her today (I am writing this on Friday June 3 2016) that I have a surprise for her. I gave her one hint. I told her that the surprise was linked to an iron bridge. Will she figure it out? The healthy (11 buds about to open) ‘Abraham Darby’ Rosemary and I found at the UBC Botanical Garden shop (Shop in the Garden). I will present it to her today when she comes for dinner. Her mother, father and sister are moving in late June to their new digs a little strata title house they have purchased in Burnaby. It has a shady back garden but a very sunny front space. I will not pressure Lauren in any way. She just might get enthused in planting her new rose. Link to: Don't See Me! I have no explanation for the fact that roses that suffered for years in our Athlone Street garden in Vancouver are rewarding me with lots of wonderful blooms in our new small garden in Kitsilano. There is an “old wives" rosarian tale that states that if you plant a rose near another one or take one out and replace it in the same spot, with another, the rose in question will not thrive. It seems that roses might throw off nasty antibodies to protect their supremacy. And you might think that by planting an identical rose next to its sibling that it might do well. Well it seems not. For years I ignored the above. Our Athlone garden had encroaching shade from a neighbour’s trees. Lack of light, sunlight and the old wives’ tale might have resulted in my declining rose plants. In the new little house there is fresh new dirt (but I must add that it has lots of clay and poor drainage) and a lot more sunlight and light. Rosemary and I purchased bags of grit and sand at a garden centre and we have been amending our wet and spongy soil. Perhaps all that has made my 20 roses (I counted them today!) happy campers. Just a few days ago I read this article about rose perfume in the NY Times. It is most enlightening that men might splash themselves with the stuff. I stopped using after shave around 1977. My fragrance of choice was Vetiver. I liked its pungent spiciness. The production technique originated in Persia and then spread through Arabia and India, and more recently into eastern Europe. 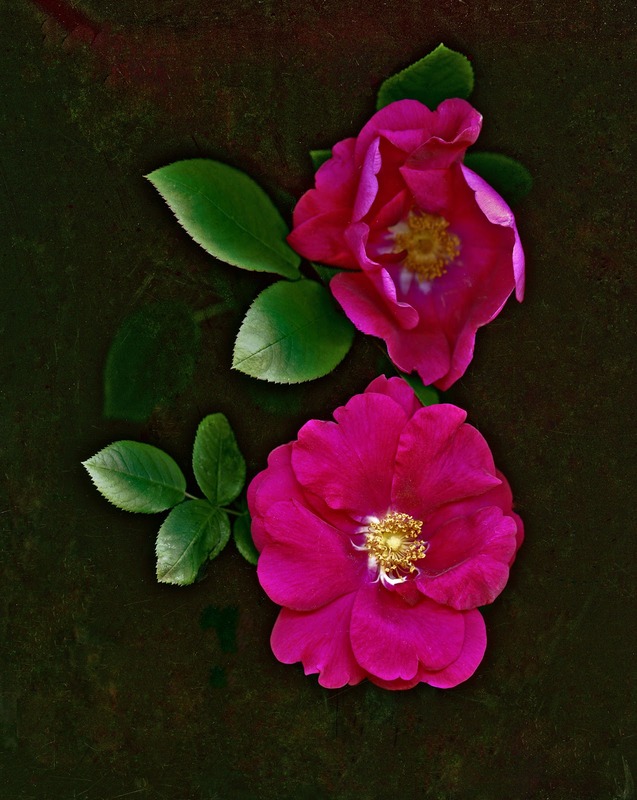 In Bulgaria, Iran and Germany, damask roses (Rosa × damascena 'Trigintipetala') are used. In other parts of the world Rosa × centifolia is commonly used. 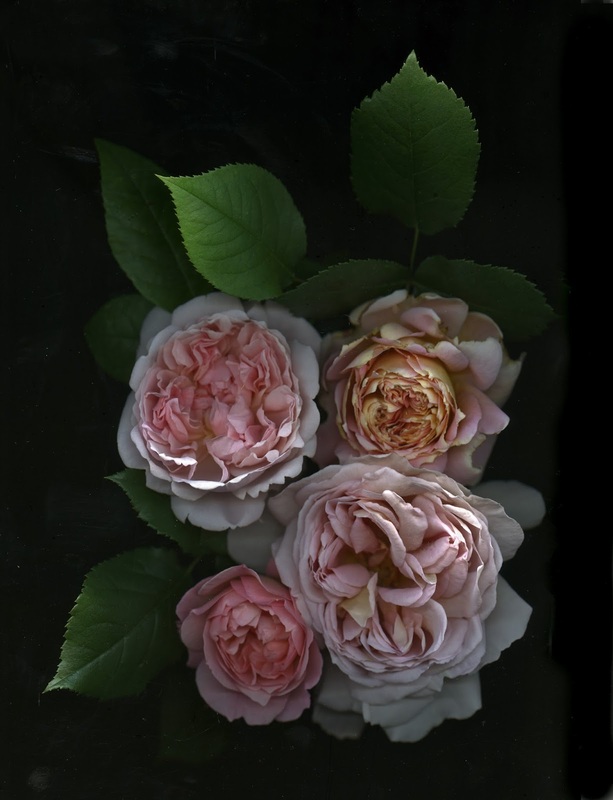 Since about 1990 I have been crazy about David Austin roses particularly in the ones that are myrrh scented. The first one in my garden around then was Rosa ‘Fair Bianca’. This is the rose that is now thriving in my Kitsilano garden. It is in a very large Mexican clay pot. I have tried to describe the scent several times in my blogs. I have mentioned that it is reminiscent of and a combination of Magnolia grandiflora (soap if there is such a thing! ), Pernod (better than that common word licorice), lemon, pepper and some other botanically secret ingredient come from up high. I wonder why nobody has tried to make a perfume from this magical scent that the English call Myrrh? He would have been horrified by all this. He would have been horrified to be in a bank vault for all those years. He would have been happier sprinkled on a rose garden. This is interesting for me as it may be the only information around that tells me that James Mason may have been a rosarian (a gardener into roses). English rose breeder and expert on roses, Peter Beales (died in January, 2013) hybridized a rose called Rosa ‘James Mason’ in 1982. What is notable is that this beautiful rose, doing splendidly in our Kitsilano garden, is a modern Gallica. This is like saying Ford has come out with a brand new (exactly like the original one) Model –T. Gallicas, also called Roses of Provins, are ancient roses. One of them Rosa gallica officianalis became the emblem of the Lancastrians. They are extremely fragrant but only bloom once. In this 21st century we want more of everything and with roses we expect them to be remontant (bloom more than once all summer into fall0. 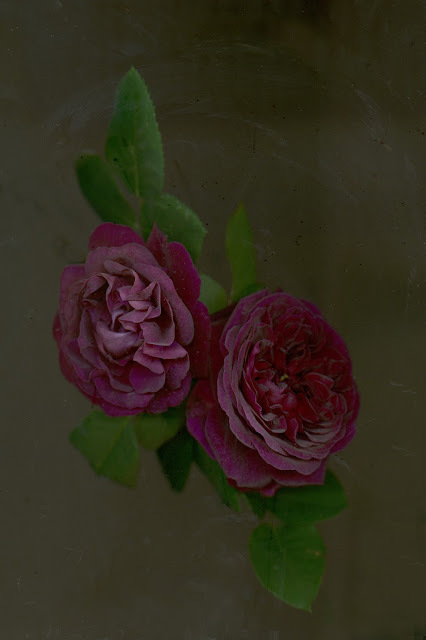 But Gallicas have one advantage over many modern roses. They are extremely hardy and resistant to extreme cold and heat. Many of the Gallicas in my Athlone garden that could not move, because of space, to our small Kitsilano garden we took to our daughter’s home in Lillooet. It is the hottest spot in Canada in the summer and a cold desert in the winter. Our daughter has reported that the Gallicas are doing just fine and this includes one of my favourites Rosa ‘Cardinal Richelieu’. Recently I wrote about the wonderful surprises a photographer can encounter when making an unintended mistake. I wrote about it here. 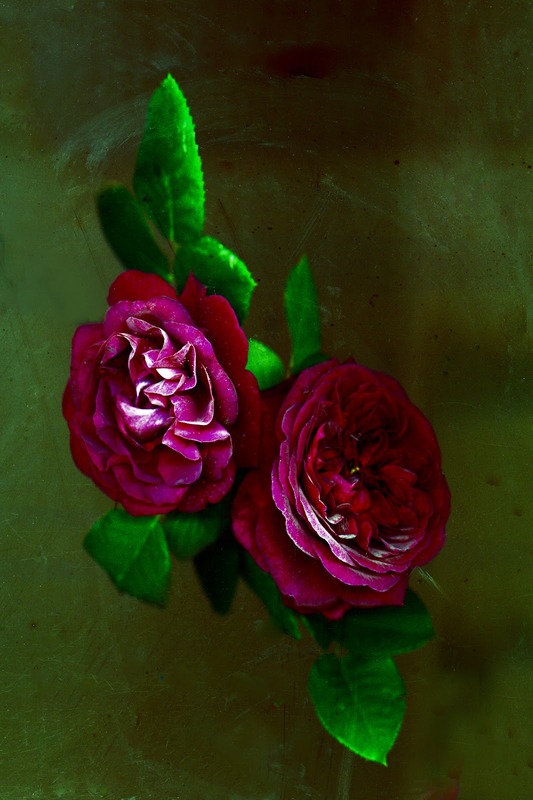 Today I decided to scan two very deep red roses. 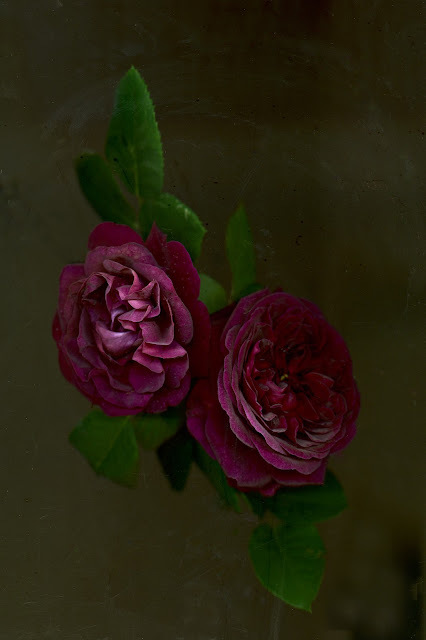 One is the English Rose Rosa ‘Munstead Wood’ (the name of noted 19th century English gardener Gertrude Jekyll’s garden) and the other the 1865 Hybrid Perpetual Rosa ‘Souvenir du Docteur Jamain’. 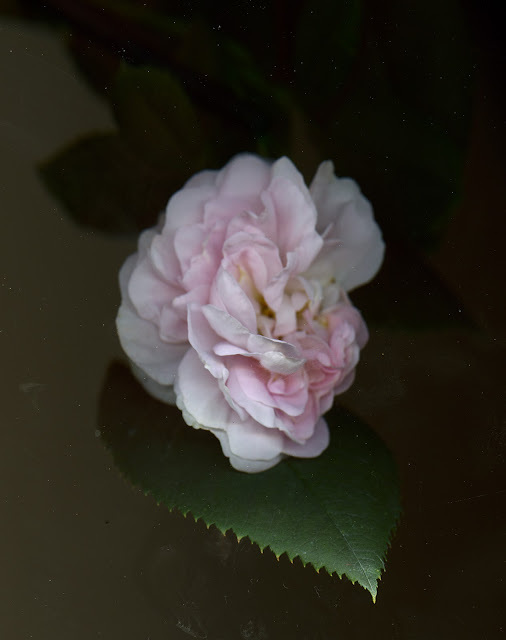 I used clothes pins to suspend the two roses on a green bamboo stick over my Epson Perfection V700 Photo scanner. Unknowingly my first scan had the colour negative colour restoration option checked. The effect was startling! The other two 'normal' scans are my usual and more accurate interpretations of what these roses look like.The sort of painterly effect is the result of having the roses not too close to the flatbed glass. Rosa 'Great Maiden's Blush' is an old rose cultivar known since the 14th century. 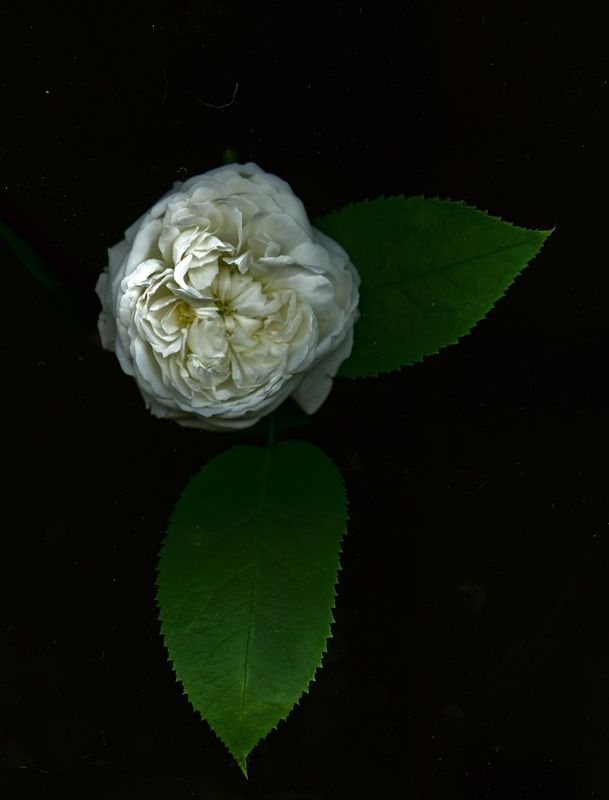 Like other Rosa × alba cultivars, it is very winter hardy, a tall shrub with arching branches, and the flowers are sweetly scented. It blooms in spring only. The young buds tend to have a creamy yellow color on the outside. 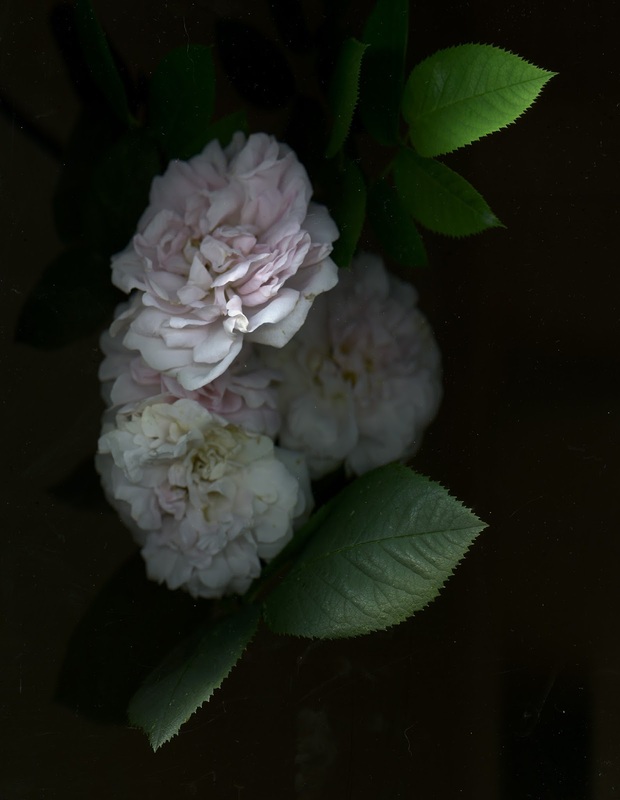 The flower petals are creamy-white or white in the bud, then pale pink, and finally fade again to white. It is not overly prickly, has relatively few thorns. It tolerates shade and it can be grown on or beside north-facing walls (in the northern hemisphere). It has enough strength and vigour that it can be used as a climber. This cultivar is known by many other names, including 'Cuisse de Nymphe', 'Incarnata', and 'Maiden's Blush'. The above is information from Wikipedia. It is fairly accurate but I prefer English rosarian Peter Beales’s (now sadly dead) from his beautiful and very complete book Peter Beales – Classic Roses. The Flower Garden, an old gardening book of 1840 lists forty-two distinct cultivars, quite a few of whose names I have not seen recorded elsewhere and which are probably simply variations of R. alba ‘Maxima’or ‘Maiden’s Blush’, cultivars I frequently get asked to identify each year. These two cultivars between them have more alternative names than any others I know. ‘Maiden’s Blush’has been known over the years as ‘La Royale’’La Suidisante’, ‘La Virginale’, ‘Incarnata’ and ‘Cuisse de Nymphe,’ a slightly deeper form having the name ‘Cuisse de Nymphe Émue’. It is was this rose, growing in the garden of my birthplace in north Norfolk and affectionately known as ‘Grandad’s Rose’, which first excited my curiosity and led to my lifelong affinity with roses. I have a vivid childhood memory of enjoying this rose, drawn to her no doubt by her ‘expensive’perfume, which seemed to pervade the entire garden each June. Despite years of neglect, this old plant is still growing exactly where I remember it, and it will certainly outlive me. It gives me pleasure to know that her offspring are now growing in many places of the world, since it was this very plant that I obtained my first budding eyes of this old cultivar when starting my nursery thirty years ago (Beales’ book first published in 1985). For the almost 20 years that I had my ‘Maiden’s Blush’ in our Athlone garden it suffered from a disease called botrytis. The buds would not open. They would become yellow and fall off. Since we moved to our small Kitsilano garden I have been astounded that ‘Maiden’s Blush’and other albas no longer have the disease. I waited for days before I finally cut off the rose you see here. It is past its prime as the separate blooms have gone to white. But the perfume is there! My guess is that even very old, old roses need a change and new soil in a different location. In early July of 2013 I did get one glorious bloom seen here.